Remove old ini file when updating, other syntax used. Server and viewer are pairs, if you use this update, you need to update server and viewer. There appears to be a problem running settings.exe on win 7 x64 msvcr100.dll is missing, think it has been mentioned before, VS2010 needs to be installed? Also how do we integrate this with the repeater function, as I would like it it work over proxies both directions...like the v1..
setting.exe updated, should run without VS libs. This verion use udp and not tcp, you can't use any http(s) proxies. The software actual setup an encrypted tunnel between server and viewer (even when server and viewer are behind a nat router) , data never get transferred overa 3the server, but direct beween server and viewer. settings.exe now also create a sfx (SC), if you save settings it ask to create one. Text can be edited via settings.exe ( custom button). Bmp and Trayicon be replacing the files in the sfx subfolder. Thanks so much for the software. I have an issue with a program causing loss of control when server running in app mode. Basically, when this program gains focus, I have no control over pc, but when focus is moved back to a different application, I gain control back. This program is a port of a dos program and may run in some kind of protected instance? I don't know if this is a bug or an example of UAC or something similar. and your app to avoid being blocked by UAC. first i have to thank you for your work an this great software. Before a couple of weeks i tried the old PcHelpware and now i saw that there is a new version. It looks realy good but it's not exactly that i'am looking for. - Enable users to show or see their desktops in LAN or via Internet. - A quick and easy way to get connected. generated by the server program. The viewer-user type the given number to the viewer program and the connection starts. - Running my own access server listening to a port that is open on any firewall. Mike, i think it's not possible to make a simpler connection. 1) You create a server sfx version via the create sfx button, this preset group and accesscode. 2) Send predefined server to server user. 4) User start viewer. The viewer show the "accesscode" of the PC as soon he is online. 5) The server user need to tell the password to the viewer user. The current version works on lan and internet and bypass nat routers, it even bypass some corporate firewalls. i like to test this in detail but there is one problem. The first try failed because our corporate firewall blocks the used port. So i presume that most of other firewalls will do the same. Is it possible for your access server to listen to port 80 (for example) because this port should be open on any firewall? Does you firewall also block outgoing ports ? Usual the only lock incoming ports. Both viewer and server are making an outgoing connection, no incoming port is needed. The local windows firewall block outgoing ports, but on first start it ask if the exe is allowed to call out. PCHelpWareV2 use UDP, not TCP. Even if it use port 80 ( web access) the standard 80 port is tcp. The reason we use UDP is that you only have outgoing ports and you don't need to allow or portforward anything on the routers. I cannot successfully run the Viewer 2 times in a row. It fails to connect to the group. 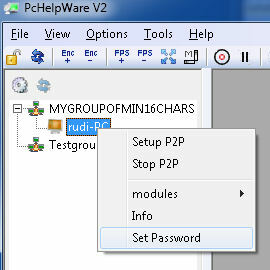 It works on the first launch when it asks to setup the Group Name and password but not after closing it. I have to delete the .ini files to start over. If it stay "offline" you can press the reload button ( next to the settings), this reinitiaze the "access server connection". Initially this newer version worked but now I am having he same issue. Hitting the refresh button has no effect. The viewer just does not connect. How would I go about doing a fresh install? I tried uninstalling and reinstalling but it appears the settings do not get erased. Should I be using RC1 AllinOne instead? After a little testing i found a problem with setting a custom "save password". Bug corrected and setup_viewer.zip reuploaded. Found another item, Installing server in XP results in server setting unable to launch. It does prompt for and install DOTNET 4. Then reboots and continues the install. But still unable to launch. Also it does not allow for Custom groupname during install, just goes to default. On a Windows 7 x64 box it installs and works. Damm MS msi installers.... i even don't use dotnet 4, but i guess MS installer does. Development was done on win7,need to test it on XP. Rudi De Vos wrote: This verion use udp and not tcp, you can't use any http(s) proxies. Sorry just to clarify, does that mean this will not work over proxies? This doesn't work over a http proxy. You can't transmit udp over a tcp proxy. Rudi De Vos wrote: Damm MS msi installers.... i even don't use dotnet 4, but i guess MS installer does. The server will manually start when clicked, but the Settings will not. MSI installers are good for some things, but in this case not so much. Damn MSI installers. Scratch that, found that my system didn't get the new version originally. Redownloading resolved. It now asks for password everytime. i guess most of the corporate firewall follow the principle — everything which is not allowed is forbidden. So it's not possible connecting the access server from within the lan. I checked the settings of the firewall and the only open udp port is 53 for dns queries. Is it possible to use this port or is there another way to get through the Firewall? web based solution that only use 443 ( ssl). Possible you have a dmz, run the viewer component on a dmz server and connect to it via rdp or vnc. Wow, it looks like everyone knows how to use ini to make the viewer knows the password and control the server. I am thinking about writing some script to auto control the viewer. Is it possible to have the viewer read the password information from ini file? and how? so instead of manually type those password in the viewer, it reads some command to run? Found, in XP you need to do special things in the source to use some gui stuff, if not it just doesn't create a window...LOL. 3.1 seems to be required, but that exist by default in XP. The server setup is working in XP now but I just tried it on another test box and the DOTNET4 requirement is still there. This test box is Win 7 64bit. File dates are 1/12/12 2:50PM. 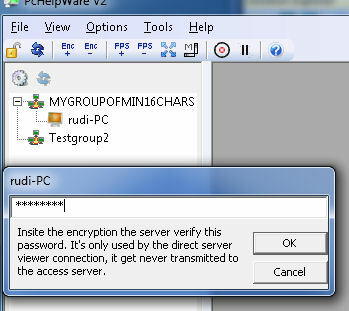 I am having trouble with the digital signature of my created SC from withing PCHelpware V2. Is there a way that this created EXE will be signed so that users using Internet Explorer can download and run the EXE? In the past versions, I had hosted the EXE on an FTP or HTTP location and emailed a link to my user who needed support. Now, they can't run the created exe unless I direct them to hit save and then "unblock" inside of the properties of the file. Possible we can setup some future online tool for it.